When hungry Deer asks Possum how he stays so plump during the long dry season, the sly marsupial gets an idea. It wouldn’t take much for Possum to help Deer; he could just climb that ol’ persimmon tree and knock down the fruit. But Possum is just plain lazy and he’d rather trick Deer into doing the work for both of them. Once Possum decides to take advantage of his starving neighbor they both become marked forever. 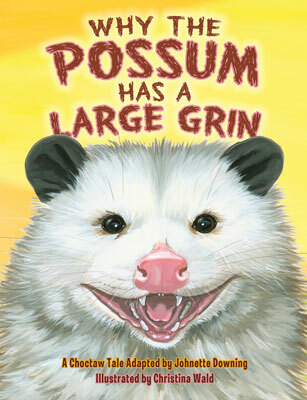 This narration of Why the Possum has a Large Grin is available on Johnette Downing’s Reading Rocks CD, and in book form by Pelican Publishing. It is also available for purchase on Amazon.